To get there, I lightly sanded the whole thing with a rotary sander. 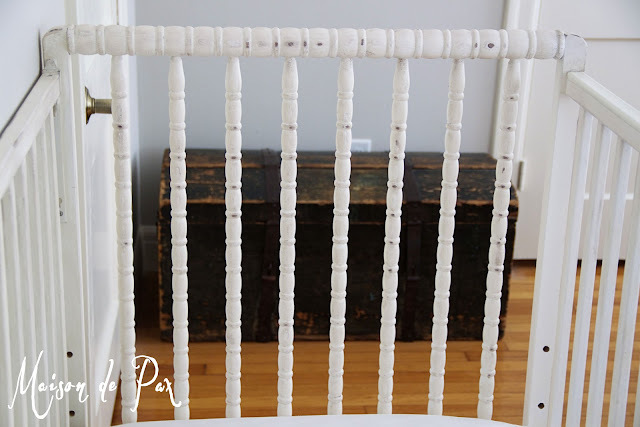 Even chalk paint would have had a hard time sticking to that slick surface. Plus, I needed something more difficult to distress than chalk paint because I didn’t want the white shiny undercoat to show through. Then I spray painted with a flat, off white spray paint from Lowe’s (that more or less matched my trim in the room). I then used some leftover drop cloth fabric to mimic the crib skirt of my inspiration nursery. The box pleats were easy, and I managed to use existing hems. A snap! Since my son will be one next week, there’s no point in the bumpers… I fear he would simply use them to climb out of the crib! Anyway, it’s definitely a step closer to the overall feel I am going for in this room, and it makes the room feel bigger. Best of all, it came in at a whopping $7 for two cans of spray paint! That’s my kind of project. 🙂 Come back soon to see the full room reveal. Wow, what a great looking crib! It looks fantastic in the room with all of the other furnishings. So bright and cheery! I always love reading your posts and seeing what creative things you come up with. So cool! 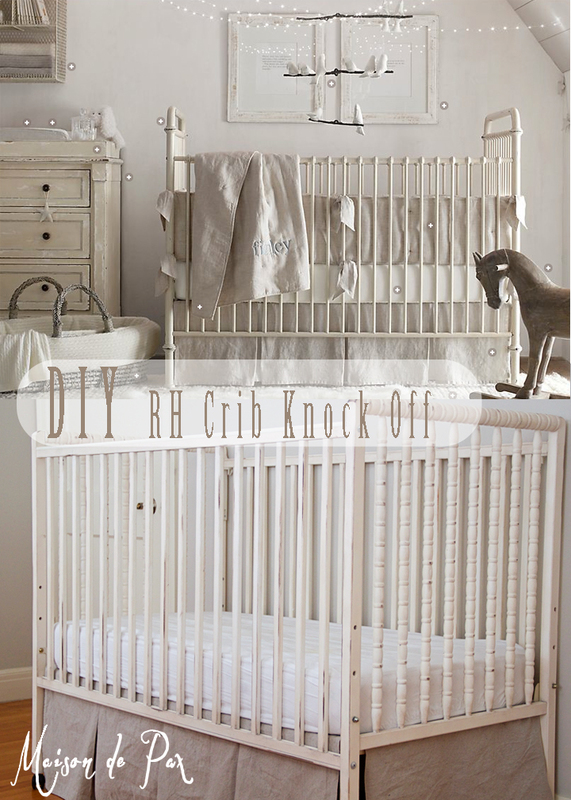 Hope to have my crib redo up on my blog this week! LOVE this crib! Great job! Thanks for stopping by, Rita! And thanks for the invitation!! This is beautiful! I love knock offs.. especially free ones! I love the rustic look with the light sanding! I too am redoing our babies room! such exciting times! What a great idea! I’d love to see what you make. Thanks for coming by! I don’t have any kids yet but I’m constantly scouring Craiglist for a crib just like this! I can’t wait to look until I actually need it because then, I’m sure, there won’t be one in a 100 mile radius. lol. Love it! Gorgeous! I just refinished our crib too in neutral. Love it! Thanks, Taylor! I love your blog, by the way. Thanks so much for stopping by!! Darling new crib! 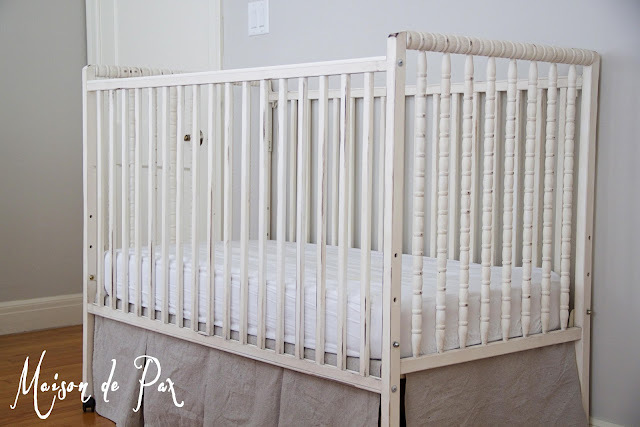 I love spindle looks anyway, but on a crib it makes it that much more adorable! Thank you so much! I’m so glad you stopped by, and I hope you’ll come back! Thank you again, Amber. Can’t tell you how much that honors me! So cute. 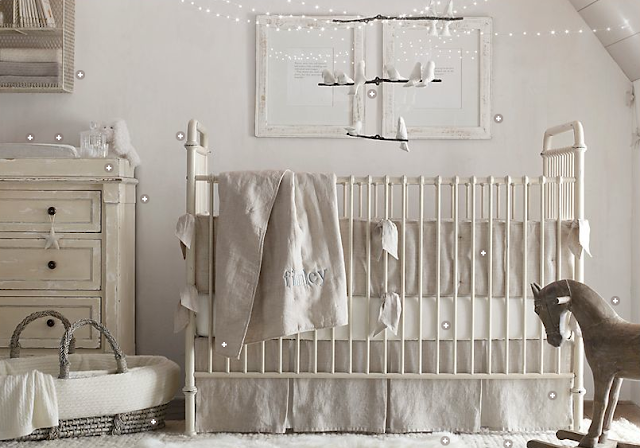 Love the crib and the bedskirt! I was thinking I might need to make a drop cloth skirt for my vintage laundry table that I will be using in my craft room. Really like how you pleated yours! Thanks for sharing with Share Your Cup. Hi, I was wondering if using those paint/wax products is safe for babies or if it could be toxic if they happen to chew on the railing? How long did this process take you? Hi Katie, great questions! The three products I used were wood stain, spray paint, and an all-natural beeswax. The wood stain and spray paint (non lead-based, low VOC, etc.) were the same type of finishes applied in factories on any other furniture. The beeswax is especially safe given that it’s actually natural as opposed to the others. However, I also gave myself peace of mind by using a plastic guard on the top edge of the side crib rail. 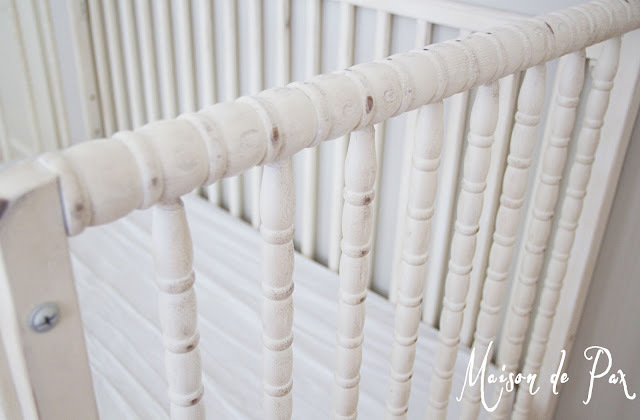 Though a baby very well might chew on other parts of the crib, the main part they tend to chew is the top rail on the outside edge, and I had a plastic guard that matched the crib (it’s actually there in the pictures, though you can’t really even see it). That gave me the extra security I needed mentally! 🙂 And I think I did the process in two naptimes… One for painting, another for sanding, staining, waxing. Maybe 4 hours total? Hope this helps! I just stumbled across this and LOVE the skirt! Do you have any detailed instructions on how to make it? I can sew, definitely not the best, but would love some extra instruction on it or how-to for it! Wonderful. Congratulations!! I’ll try to fit a tutorial in sometime in the not to distant future. I hope your pregnancy continues smoothly! 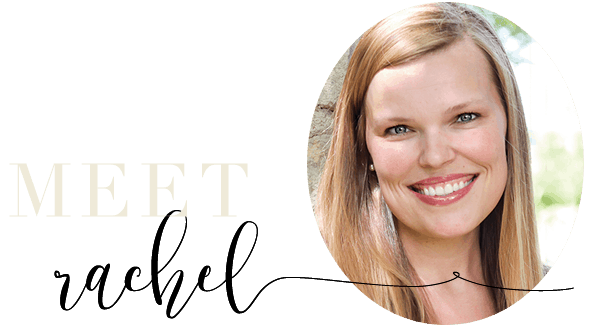 Rachel it is lovely. I am hoping that it meets the current safety codes also. 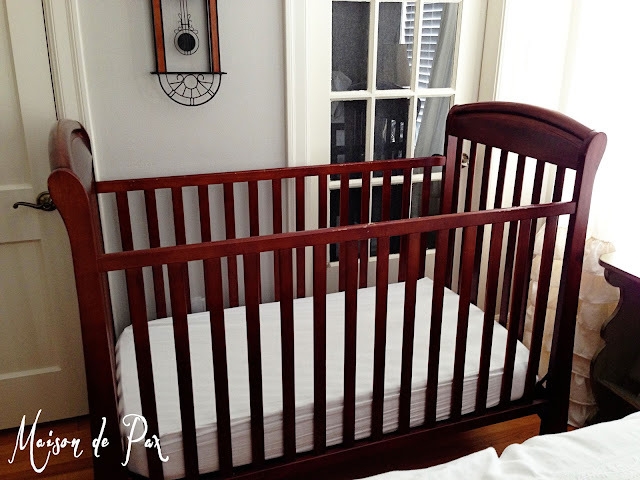 Sometimes old cribs have movable sides and rails spaced too far apart. Better safe than sorry. God bless your family. What a wonderful bed,everything you do is just perfection,you are a very talented person.Hope you have sold your house,i know you are anxious to move. Who knows with you getting a little closer to Okla.we may meet.Have a great week. 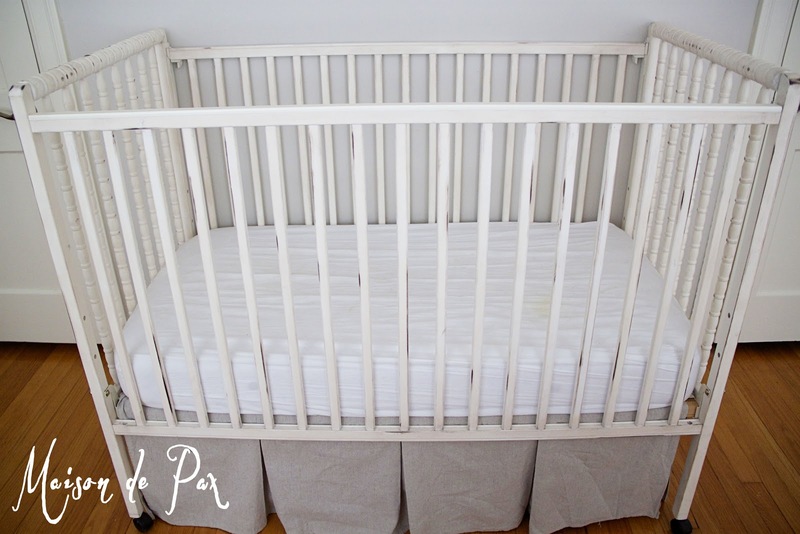 Love, love, love your Spindle Crib? 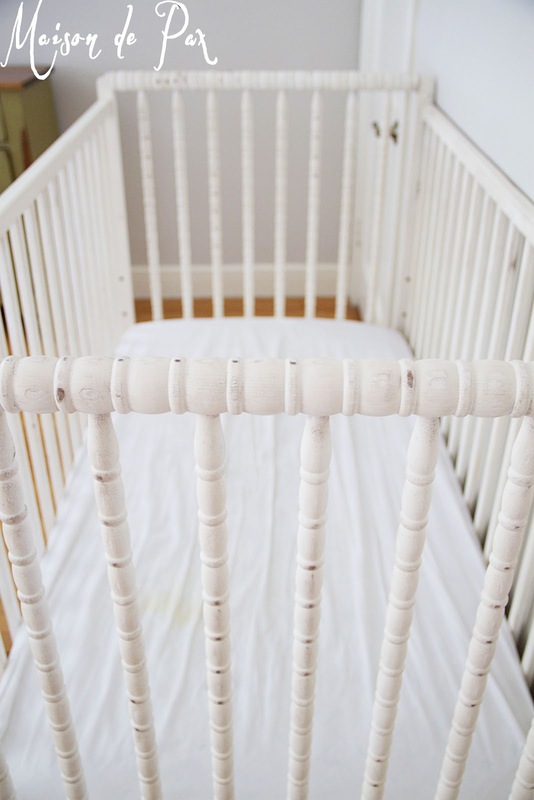 I have a Jenny Lind Spindle crib that I have stored for my son to have for his children. His wife doesn’t want it because she says it’s not up to current safety codes and sides have dropped on those cribs and babies have lost limbs! Wow! I don’t know how my son survived in that crib! But I’m going to refinish it just like yours and have it at my house for my grandson when he visits. Have you looked into upgrading to comply with current safety codes? I need to look into that or they won’t let him in it! HA! Thank you so much, Cathy! I actually gave myself peace of mind by simply putting a large bolt through the drop down side. So it is now secured similarly to the stationary side (it simply removes the drop down feature). I also put that side against the wall (not because I don’t think it’s safe but because the plastic piece that allows it to drop down is ugly. Ha!). I hope this helps!